UMass ended ranked #15 in the Massey Rankings, which is a computer rating based on wins and quality of the schedule. The CAA was first of the FCS leagues and has seven teams in the top 20. QB Brian Hudson verbaled to Liberty. I blogged about him back here . OG Keith Bourne verbaled to Boston College . I did a blog post on him here . Former UMass Captain (1977) Peter McCarty is defensive line coach for the Western Michigan Broncos. I first saw this on the UMass Athletic Dept's "Just a minute' column. 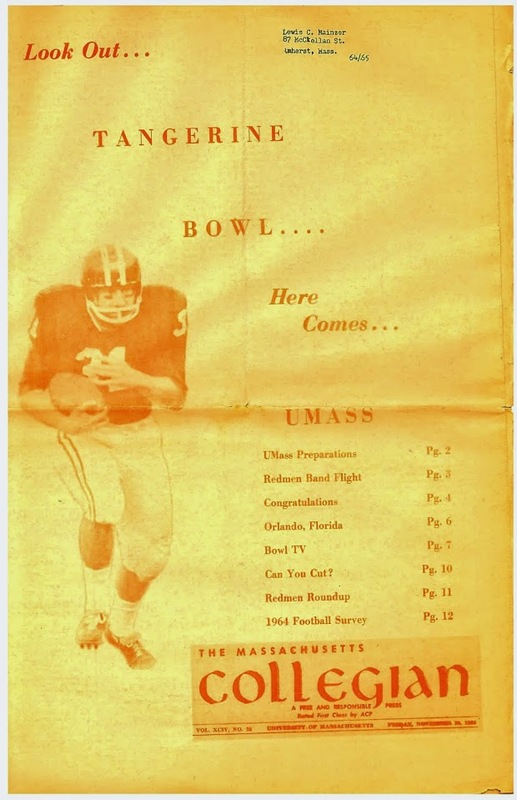 More scans from the 1977 team are in the "UMass Football History" link in the Blog side bar. 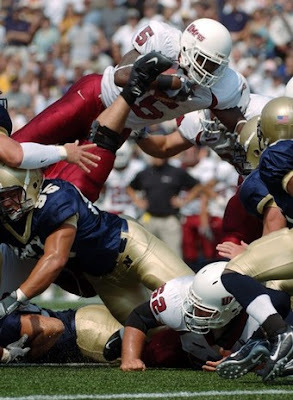 This blog post happens to be the 500th post for 2008 and the 2,326th post since the start of the UMass football Blog back on June 5th, 2005. The very first blog post is here . Bruce Dowd has a long article about the Richmond-Montana Championship game with many pictures. Josh Buchanan has released his 2008 FCS All-American teams. Several UMass players made the third team. For the first time ever, UNH was able to red-shirt their entire 2008 recruiting class. Brought to my attention over on the excellent New Hampshire Football Report. Image by Partick Raycraft/Hartford Courant. 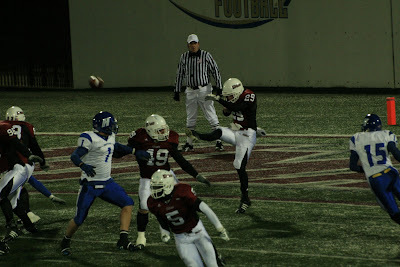 Interested in UMass is Ryan Gemmell a 6-0 190 pd Safety from Southington Ct. He was Hartford Courant's Defensive player-of-the-year. Runs a 4.7 40. He won this strength and agility contest in 2008. He's also interested in Rhode Island. Brandon London played a part in the Miami dolphins 24-17 win over the Jets. After winning the FCS/I-AA tittle, London's dad Mike London is considered a hot property. UConn's offensive coordinator Rob Ambrose has been named head coach at Towson. The CAA website has an extensive article on Ambrose here . UMass' 2008 BCS opponent Texas Tech plays in the Cotton Bowl Friday. TV schedule for all the bowl games is here. C.J. 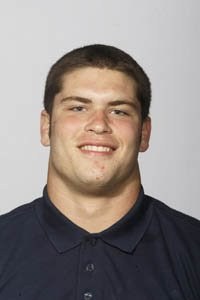 Marck a 6-1 238 pd freshman LB for UConn is seeking to transfer to a FCS/I-AA school. His UConn bio is here . Marck's Rivals page is here . He played in ten games for the Huskies and had 7 UT 2 AT 1 PrBu 1 FF. We need a MLB who can stop the run. The Blog thinks that he would be a great fit for UMass. UMass is recruiting Matt Faiella a 6-3 225 pd OLB from Freehold Township in NJ. ESPN video highlight here . He was second team All-Jersey Shore (along with Anthony Lubischer, whom we are also recruiting). Also being recruited by Akron, James Madison and Delaware. There has been quite a bit of UMass recruiting news lately, but nothing of note this morning. In the rush to keep up on recruiting, some stories may have escaped your notice. Maine QB Adam Farkes quit the team? The Arena Football League folded? The average 40 times in the in the Pro Football Combine were not as fast as you thought. Over in BCS football, quite a few bowl games feature teams with 6-6 records. Rice University student geneticists are trying to develop cancer fighting beer. Cal Poly's coach Rich Ellerson has been named Head Coach at Army. Were you surprised to learn that, outside of college football, 2008 was very strange . The New Hampshire Football Report has a post saying UMass picked up its second verbal of the 2009 season from Christian Birt 6-1 180 RB/DB from Laconia HS in New Hampshire. He was First Team All-State in 2008. Had interest from Boston College and Colorado. Special thanks to Roger Brown the owner of the NHFR for bringing this to my attention! New Hampshire gets a commit from a PA defensive end. Steve Baylark (Denver Broncos bio) has been re-signed to the Broncos practice squad. The second largest University in Texas, UT San Antonio will join FCS football in 2011. UMass is recruiting Derek Tinsley a 6-1 265 pd DT from Meadowbrook HS in Richmond, VA. He was Central District Defensive Player-of-the-Year. This article mentions him. Relevant quote:For Meadowbrook, defensive lineman Derek Tinsley seemed to be in on every running-play tackle. Also being recruited by Duke, Army and James Madison. 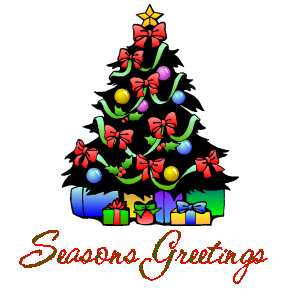 The UMass Football Blog and Mrs Blog would like to wish all a Merry Christmas and a Happy New Year! One of the best presents I've had in the last three years is the opportunity to meet, in person, and on line, UMass fans, players, parents and staff. Hope the New Year brings everybody, health, happiness and prosperity. UMass is recruiting Karl James a 6-2 255 pd DL from Sunset Fl. He played in the annual Miami-Dade County All-Star Football Classic . Also being recruited by Florida Atlantic and Wagner. UMass is recruiting Jadira Green a 6-3 305 pd DT from Oxon Hill Md. He's rehabbing an injury, which is probably why FCS/I-A football schools have a chance at him. JMU and Wagner have rescinded their offers due to his injury. Still has scholarship offers from Old Dominion, Sacred Heart and Delaware. I've blogged before about Royce Terrell, a projected college safety from Weymouth, MA. This story says UMass has offered a scholarship. The Sports Network has their report on the National Championship game here . 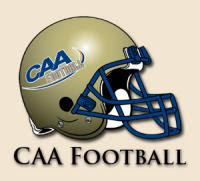 The CAA football site has the league's write-up on Richmond's win here . Three pages 0f JUCO quarterbacks here . The most active JUCO leagues are out west. CSN reviews all thirty (not counting 2008) of the FCS Championship games (pdf). The three UMass participated in are ranked fairly high. UMass is interested in Tim Chambers a 6-3 285 pd Center from Bristol Ct.
Has interest from many schools: UConn, Iowa, Ol Miss, Mississippi State, Temple, Army, Navy and Buffalo. At FCS/I-AA level, Hofstra and UNH. 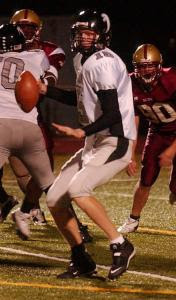 UMass is interested in Dan Guadagnoli a 6-1 200 pd QB from Framingham, MA. The Milford Daily News has a story here . MetroWest has another story on him here . He was a Boston Herald All-Scholastic. He had 2,500 yards of total offense for Framingham, including 25 TDs throwing and another 15 rushing. Also being recruited by a host of FCS schools including Northeastern, Maine, Penn, Rhode Island, Fordham and Lafayette. 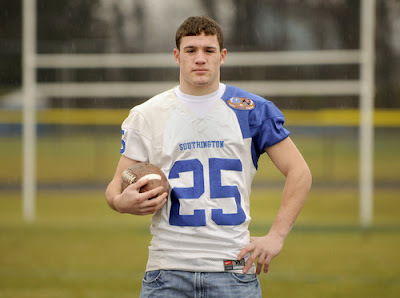 Sean Unterkoefler a 6-1 210 RB/H back from Exeter Township, PA has committed to UMass . His Rivals.com page is here . Note the 4.48 forty time. Video highlight clips here . A Scout.com two star player. He had offers from UNH and RI. Interest from Army, Temple, UConn, JMU and Hofstra. Welcome to the Minutemen Sean! Hope you have a great career with UMass! Brent Arnold was named to Associated Press All-FCS first team. UMass story here . Yale Daily News "Two candidates withdraw their names"
Springfield Republican "Brown no longer in running for Yale Job"
Matty Vautour has the latest "Boola Boola, UMass coach staying put"
Richmond"s Head coach London is the first black coach to go the the National Championship game. The Montana coach is familiar with the London family (mentions UMass and Brandon London). Two pages of links to stories concerning the National Championship game via Google News here . Lawrence Sidbury, DE for Richmond is also a computer science major. He's working on software to predict predict offensive plays. Armati Edwards of Appalachian State won the 2008 Walter payton Award. Mickey Matthews won the Eddie Robinson Award for the top coach in FCS. Greg Peach of Eastern Washington won the Buck Buchanan Award for top defensive player in FCS. For news about Coach Brown see the post before this one. CSN is at the National Championship game and has a audio link to interviews with various personalities including UMass AD John McCutcheon . David Coulson has an article about the Montana Grizzlies warming up in Chattanooga. On recruiting news, can someone from UMass football call this guy? Also on recruiting, I've updated the Blog post on Mike Goad. Matty Vautour has an article on the possibility of Coach Brown leaving. Hopefully he will stay and hopefully the current recession and associated budget cuts will not last long. UMass football and UMass football fans will have to hunker down and wait it out. Another article (unsigned) by the Springfield Republican says the Athletic Dept is not happy with the news. UPDATE: Holy Cross coach Tom Gilmore has withdrawn his name for the Yale coaching job. UPDATE II : Matty Vautour reports that Coach Brown is staying. UMass is recruiting Joshua Buchanan a 6-3 285 pd center out of Newman Ga.
Also being recruited by Auburn, Georgia Southern and DII. Keepers has Richmond by 2 over Montana. A story about Richmond's Coach Mike London. David Coulson has his weekly column "Around FCS" and finds that Montana-Richmond is an unexpected event. The National Championship game is 7:00 pm Friday on ESPN2 HDTV. If you missed either (or both like I did with the ice storm), ESPN360 has the games available online. Bruce Dowd in his weekly CAA column Eats Crow . Dave Coulson says JMU ran out of miracles . He has another column saying one point separated UNI and Richmond . This report says Coach Brown is a finalist for the open head coach job at Yale. Brown's salary would probably double at Yale. If he wants to retire in New England, it probably would be a good move for him financially. Let's hope he stays and leads UMass to another shot at the national title. If I hear anything more about this, I'll post it quickly. 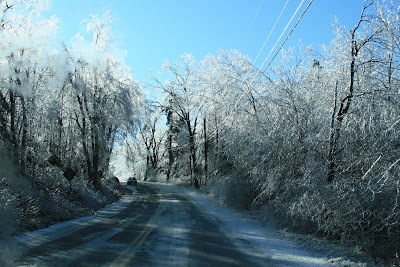 About 9:00 pm last night, the return of power was announced by our cranky furnace almost having a cardiac arrest as it struggled with calls for heat from all three heating zones and our water heater. Click on the images and Blogger displays a much larger view. Hi Everyone. 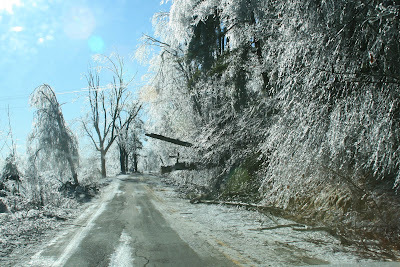 Last Thursday night, Jaffery and New Hampshire were hit by the worst ice storm in Granite State history. Mrs. Blog and I are OK, but we have no power or telephone connection. 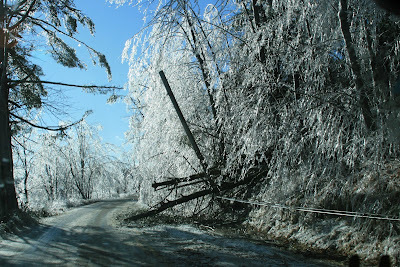 The police and New Hampshire Public Service say it may be another three days or more before we get power back. Mrs. Blog and I are surviving using our camping lanterns and related gear. We're doing OK, but it was 45 degrees inside my house yesterday. This is the fourth day without power and we're getting into a routine. 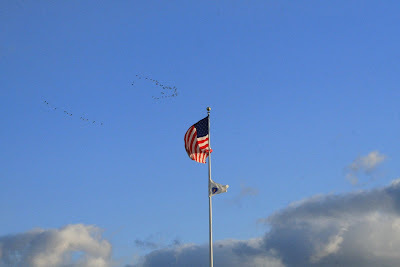 I'm blogging this post from a public library in Massachusetts. So, the Football Blog will resume as soon as I get power and internet connections back. Bedford High standout WR/DB Ryan Carter is interested in UMass. Article from the Bedford Minuteman (good name for a newspaper!) is here . 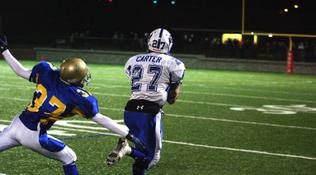 Ryan is quoted as saying his brother Woody Carter, a WR for Northeastern is interested in transferring to UMass. Image from the Hanson Town Crier is not attributed. Baker is #99. Interested in UMass is JUCO DE Nick Baker from Dean Junior College in Mass. He's 6-3 245 and runs a 4.7 40. His rather minimal Scout.com page is here. Hope he makes it to UMass. Former UMass star RB Steve Baylark has been signed to the Denver Broncos practice squad. UMass press article here . Steve's Broncos bio here . 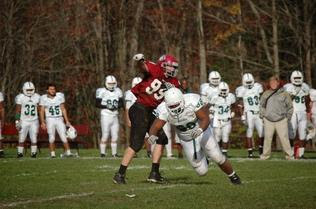 UMass is recruiting Mike Goad, a 6-4 210 pd TE out of Matoaca HS in Chester VA. He was first team All-district in 2008. YouTube 2008 highlights here . Has I-A interest from Army and Virginia. A bunch of CAA schools are recruiting him including JMU, Old Dominion, William & Mary, Delaware and Big South FCS school Liberty. UPDATE: Goad has added some additional honors since the Rivals page was last updated. 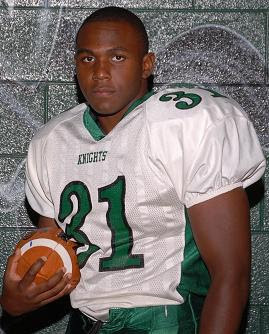 In 2008 he was 1st team All District, Academic All District and Academic All Regional honors. He finished his senior year leading his team in receptions with 31 for 420 yards and 3 touchdowns. More information about Goad and some video here . UMass is recruiting Stephen Fox a 6-4 240 pd TE from Eagle Lake, FL. The Ledger has an article that mentions him here . Also being recruited by Buffalo. We loose one in the recruiting wars. Lametrius Davis a 6-0 193 pd JUCO DB has committed to Hawaii. Also in the running were Utah, Brigham Young, Oregon State, Washington, Washington and Boise State. That's pretty good company we were competing with. We loose another. Blaze Camponegro a 6-1, 205 pd FB committed to Temple. Keepers Football Ratings has JMU by 8 over Montana and Richmond by three over Northern Iowa. 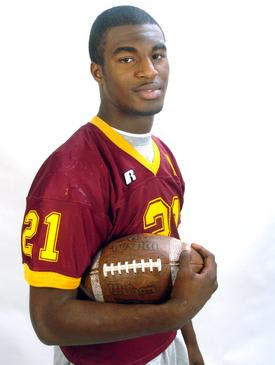 David Coulson has his weekly "Around FCS" column up---entitled "Turnovers, turnovers, turnovers"
UMass is recruiting Octavius Myles a 6-0 207 pd TB from Windsor Forest HS in Savannah GA.
Also being recruited by Bowling Green, Costal Carolina and Savannah State. Did you know Mark Whipple interviewed for the Syracuse job? The excellent college blog "The Orange Report" (run by a UMass grad incidentally), has some info (scroll down the Dec. 4th post). I spotted this over on Mike's UMass message board site. The athletic dept is working on a new scoreboard for McGuirk (pdf). The UMass football Blog is somewhat disappointed to find that it will not include a video screen. But even no video screen will continue the run of improvements to McGuirk. Certainly, the old and broken scoreboard we have now deserves replacement. The Montana-JMU game will be televised Friday night on ESPN2. CSN recaps the weekends FCS playoff action here . Texas Tech is in the Cotton Bowl. Well, yesterday was a busy day in the Blog household. I cut a Christmas tree at a tree farm. I got the tree set up (but not trimmed) and then got to watch some of the Spiders-ASU game on ESPN360. However, at 3:00 I had to take Mrs. Blog to do some Christmas Shopping. It's only eighteen days until Christmas and Mrs. Blog and all her female relatives have gone to DEFCON-1 EMERGENCY CHRISTMAS shopping mode. Then we went to Mullins and watched UMass take Boston College to overtime. The blog thinks Ricky Harris needs to shoot more. Mrs. Blog thinks that the shorts don't do anything for the dance team. We didn't get home until about 1:00am. Matty Vautour recaps the UMass-Boston College game here . While we were away, two CAA teams advanced to the semi-finals. Richmond made sure we have a new champion in FCS (Thank you, Lord!). More Spiders-ASU stories here and here and here . I taped the New Hampshire-Northern Iowa game and it seems it was a wild one . The Boston Herald has a story on the Wildcats loss here . Mrs. Blog and I will be trimming the Christmas tree soon and I'll be watching the tape of the UNI-UNH game little later. A light snow is falling. What could be a better day? The Blog will be back tomorrow with more UMass football recruiting news. Comcast Sports New England TV will carry the UNH-Northern Iowa game at 7:00 pm today. That's channel 435 on Dish Network. Chuck Burton has his weekly column "The CSN Way, Somewhere Grantland Rice is smiling". How bad are things at Syracuse? Al Golden, the head coach at Temple, does not want to coach there . Mrs. Blog and I will be going to the UMass-BC game tonight, so I'll be taping the UNH-Northern Iowa game. Foster's Daily Democrat says the Cats have a score to settle with UNI. The UMass athletic site has an article on UMass QB Liam Coen receiving the Harry Agganis/Harold Zimman Award as the Outstanding Senior in New England Football. Congrats to Liam for a great career with UMass! UMass is recruiting Brian Hudson a 6-3 192 pd pro-style QB from Stafford VA.
YouTube highlights page here . His 2008 stats here . Also interested are UConn, N.C. State, Virginia Tech, Richmond, William & Mary, UNH and he just received an offer from Liberty. Bruce Dowd has a long re-cap of last week's and preview of this week's CAA playoff games here . The Sports Network has its FCS Preview Week 15 up. Success in FCS football doesn't matter? That's not Appalachian State's experience. Applications, donations and corporate sponsorships are way up . Former UNH offensive coordinator is the designated successor Head Coach at Oregon. Chuck Burton has thoughts on the FCS playoffs in his weekly column "The CSN Way". One note, playoffs are not unique to FCS. Division II and Division III, as well as NAIA football all have post season tournaments. David Coulson previews this week's playoff games and predicts the winners in his weekly "Around FCS" colum. Meanwhile in the BCS Division, which does not have a playoff, over on Double T Nation, it looks like Texas Tech's coach Mike Leach will spurn the paltry $1.75 Million they pay him for more lucrative digs at Washington. In the recruiting wars, UCLA's Rich Neuheisel has been using a helecopter . Coach Brown probably does not have a helecopter. I thought this article on Club football at the University of Vermont was interesting. I'll be back tomorrow with more UMass football recruiting news. Brett Arnold, Tony Nelson and Courtney Robinson were all named All-New England. Arnold has 2,080 punting yards for the season and 4,011 for his career. Robinson had 404 kick-off return yards in 2008. That gave him a total of 1,384 yards to set a UMass record. The previous holder was Stephen Parnell (1967-1969). Nelson's 1,325 rushing yards was 8th highest single season total in UMass history. However, four of the higher totals included playoff yardage. In non-playoff seasons, only Gary Pearson (1,631-1982), Jerome Bledsoe (1545-1991) and Rene Ingoglia (1,505-1994) had more yards. Coaching is a tough occupation. Towson's head coach Gordy Combs has been with the Towson Tigers for 39 years. He played for them for 3 years, was an assistant coach for 19 and Head Coach for 17. He was fired yesterday. Texas Tech's head Coach Mike Leach has interviewed for the Washington Huskies job. More info over on the excellent Red Raider Blog, Double T Nation . David Coulson recaps last week's FCS playoff games in his weekly "Around FCS" Column. UMass is recruiting Royce Terrell, a 6-2 215 pd RB/DB from Weymouth HS. He is projected to be a safety in College football. Terrell had over 3,500 yards rushing and scored 200+ points for Weymouth. He also has an offer from Northeastern and Bryant. The Weymouth Ledger & Patriot News has an article here . Another article on him from the Patriot Ledger here . UMass is interested in Mike Peavy, a 5-7 190 pd RB from Neptune, NJ. Peavy has some serious speed as he runs a 4.43 forty. His Rivals page is here . He's ranked as a top 200 RB in the country. Another article here (scroll to end). More Peavy and Neptune HS info here . Also interested are Georgia Tech, Virgina, Temple and Syracuse. CSN has photo galleries of the 2008 season here . The list includes several UMass games and last week's Villanova-Colgate and Maine-Northern Iowa playoff contests. More links to more last week's playoff game articles here . As per a recent comment, there is now a UMass Hockey Blog. I'll be adding a link in my "UMass fan sites' section in the side bar. Good luck to the new blog and may last longer than the "UMass Basketball blog", which lasted two days. That has to be a record for brevity, even for internet fan sites. Another 2008 UMass football opponent is playing in the post season as Albany (the NEC champion) plays Jacksonville University (the champion of the Pioneer League) this Saturday in Albany. 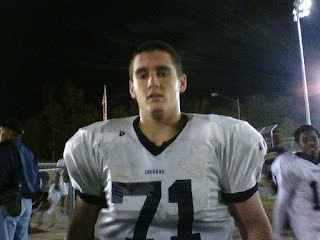 UMass is interested in Ed Roberts, a 5-11 220 pd ILB from Timber Creek HS in NJ. He runs a 4.61 forty. Also interested are Delaware, Maine, Towson, Rutgers and Penn State. Well, the Blog readers correctly picked seven of the eight first round games in the FCS playoffs. It was close on New Hampshire though. Weber State was all over Cal Poly to ruin most people's brackets. ESPN has final scores, drive charts and box scores here . The CAA website has longer write-ups of all the CAA games here . A couple of articles on the UNH-Southern Ill. game here (from the Saluki's side) and here (from New Hampshire). CSN has a bracket and more post-first round playoff stuff here . I think Weber State beats Montana and Villanova upsets JMU in the second round. In two different stories, the Salukis remind UNH of UMass here and here . The game will be streamed for free. Details here . Appalachian State Vs South Carolina State on ESPNU at 12:00 Noon. Chuck Burton's CSN column "Feasting on Football"
More FCS playoff notes and facts from CSN. UNH by 0.41 over Southern Ill.
A kind Blog reader initially us the link for this story about Jermaine McDay a 6-3 245 pd FB/LB from Keene, NH (just down the road from me). McDay also made 2008 All-New Hampshire. Also being recruited by Hofstra and Northeastern. I've blogged before about UMass recruiting Wakefield's Martin Hyppolite. 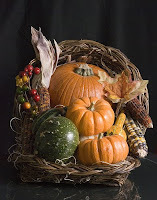 Hope all readers are enjoying their Thanksgiving holiday. Truly there is much to be thankful for. Dave Coulson prognosticates the playoffs . Bruce Dowd does his weekly CAA Today column here . Matty Vautour has a link to a video interview with Brandon London. Could Wareham Junior Justin Silveria be a future safety for UMass? He likes the Minutemen. Silveria sounds like Coach Brown's kinda player. Mostly FCS playfoffs news on the web. No TV for the New Hampshire-SIU game . Maine gets UNI in the dome . No TV for that game either. ESPNU will air probably the worst matchup in the first round: Appalachian State against South Carolina State. 2008 FCS bracket here . The Miami Dolphins lost one of their top receivers to a knee injury. That may open the door for Brandon London to crack the starting lineup. The Boston Globe has an article about Ray Doucette a 6-3 175 pd pro-style QB from Cambridge & Latin HS in Cambridge, MA. He has thrown for over 7,000 career yards. Scout.com page is here . Recruiting interest by Columbia, Harvard, Temple and UMass. 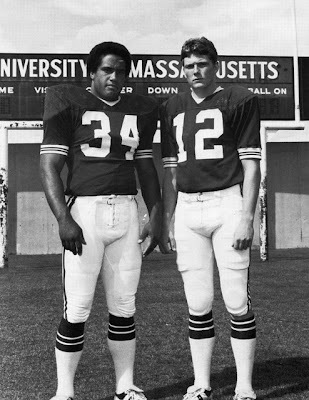 Ray, take a long look at the UMass receiving corps! Boston Globe image by Patricia McDonnell. The UMass Daily Collegian has a Hofstra game article here . Matty Vautour looks at next year's needs and discusses who will fill the seniors shoes here . Relavent quote:"He will have plenty of holes to fill as key players depart. Some can be filled from within by redshirts, but Brown and his staff will likely be actively looking at potential junior college and Football Bowl Subdivision transfers." Chuck Burton of SCN complains about this year's playoff selections . The Sports Network has its weekly column "Around FCS' here . Eleven UMass players made the 2008 All-CAA teams. The UMass website has an article on the honors here . Tony Nelson RB. In his first year as a starter, Nelson was 3rd in the CAA with243-1,325 5.5 yards/carry 12 TD 110 yards/game. He also added 19 receptions for 120 yards. Victor Cruz WR. A couple of years ago Liam Coen said we "didn't have anybody like Victor Cruz". In his first year as a starter Cruz was the top receiver in the CAA in two categories. He led the CAA in total yards with 71-1,064 6TD 5.92 rec/game. He also led the CAA with 88.7 yards/game. Vladimir Ducasse OL. Ducasse started practicing with the first team about three days after he arrived in Amherst. This year he sharply reduced his penalties and with his physical gifts became one the CAA's top linemen. Josh Jennings LB. Jennings ended up 7th in the CAA in tackles with 90TT and 8.2 tackles/game despite missing the last two games of the season. Courtney Robinson CB. Not many QB's threw in Robinson's direction and he added 18-404 22.4 kick return average. Jeromy Miles DB. Miles was second in the CAA amoung DB's with 104 TT 8.8 tackles/game and was 5th in tackles amoung all positions. Brett Arnold P. Arnold led the CAA and the nation with 46-2,080 yards and 45.2 yards/punt. Liam Coen QB. Despite his ailing arm, Coen threw for 206-2,749 61.7% 24 TD and 229 yards/game. That was the 5th highest single-seasonTDs and 5th highest total yards in UMass history. Jeremy Horne WR. Horne was 3rd in the CAA with 50-895 8TD's and 2nd in the CAA with a 74.6 yards/game average. Sean Calicchio OL. Calicchio as a fifth year player was a force on the UMass OL. Kyle Harrington DL. Harrington was 3rd in the CAA amoung DL with 50 TT 4.7 tackles/game. Congrats to all the UMass players who made the 2008 All-CAA team. And seven of the eleven are underclassmen! A Picassa web album of the UMass-Hofstra game and senior day is here . Jeff Thomas has an article about Coach Brown recapping the season . Shannon James and the Calgary Stampeders won the Gray Cup . Fanhouse has a FCS plsyoff article here . CSN has an extensive article with a bracket and individual game information here . The Sports Network also has a long article about the playoff selections here . Keepers football ratings have New Hampshire a slight favorite against SIU and Maine a nine point underdog to UNI. The New Hampshire football Report has details here . All the traditional websites seem jammed up. UPDATE: The CAA website has an article on the selection of five CAA teams (includes audio link to CAA press conference). The NY Newsday says Hofstra ends a tough season with a loss . The Worcester Telegram says Nelson stole Coen's thunder . WWLP says it was the end of an era for UMass . Jeff Thomas of the Springfield Republican said UMass ran past Hofstra . The Boston Globe said Coen's parting gift to UMass was a victory . Matty Vautour said 2008 ended with a win. In case you missed it, UNH beat Maine in the snows of Orono to make the playoffs . Playing in Hamilton, Holy Cross lost by a point to Colgate to knock the Crusaders out of the playoffs. And the streets of Lubbock Texas must have been very quiet last night as the Red Raiders were creamed by crimson 65-21. The FCS 2008 playoff selection show is on ESPNU (fixed link) at 6:00 PM. ESPNU is available on Dish Network channel 148. UPDATE: Charles Burton has an article on the FCS playoff selections here . Winning makes you warm! UMass made a big comeback from its dismal performance against New Hampshire. The UMass defense, missing four starters, may have played its most opportunistic game this year as the defenders had two fumble recoveries and two interceptions. We did not allow a point in the second half. Tony Nelson showed again he was the best player on the field with 208 yards and two TD's. Over 5,000 frozen fans showed up for the final game and a significant number of seriously demented devoted fans even stayed for the post game concert. I think the team showed a lot of character and the win was a good way to start building for next year. 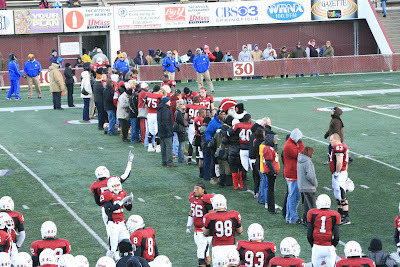 Thanks again to the seniors and all UMass players, coaches and fans! UMass write up here . Hofstra write up here . 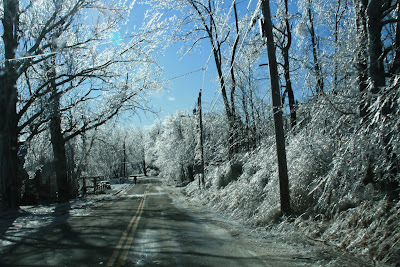 Well, it's a frosty morning here in New Hampshire. My thermometer says it's 14 degrees right now. I'm charging my camera batteries and checking my winter clothes to get ready for the game. The Herald News has a story about Shane Viveiros getting more playing time in the UMass secondary. Jeff Thomas has a game day article here . Matty Vautour has a Hofstra game article here . "I'm very loyal to UMass football," Coen said. "I hope people remember me as being tougher than maybe your average quarterback has been. To know how much I cared and how much most of my days went to trying to win games for this program. It's something I care about a lot." The Sports Network has its week #13 FCS Preview here . Chuck Burton has previews of the games of rivalry weekend. Holy Cross will meet #21 Colgate for the Patriot League championship and a playoff birth today. Albany has already won the NEC championship and awaits its opponent in the Dec 6th Gridiron Classic. And "Oh-by-the-way", Texas Tech meets Oklahoma tonight at 7:00 pm for a BCS game bid. Image stolen from the Wizard of Odds college football blog----who undoubtedly stole it from someone else. It's not accredited. Jeff Thomas states that it's a bitter-sweet game for the seniors . The Springfield Republican says Coen's last game is the end of an era . Matty Vautour says both Ben Coblyn and Josh Jennings are out of the Hofstra game with injuries. Bruce Dowd has his weekly "The CAA Today week 12 &13" column here . The Sports Network has its weekly "Around FCS" column here . This could be a tough game for the Minutemen. 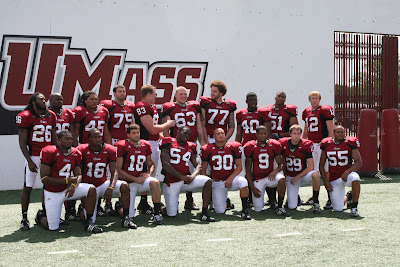 With Ben Coblyn, Sean Smalls, Brian Ellis and Josh Jennings all out, UMass will be really short on bodies. Freshman LB Tyler Holmes will get his first start. Hofstra is a running team and our depleted defense has not done well against running teams this year. I would look to the UMass offense to win this one. Tony Nelson, Liam Coen and the receivers Victor Cruz and Jeremy Horne should put up good numbers against the Pride. Get out to a good start and keep the defense off the field. Saturday will be the last game for the UMass seniors. Let's turn out for the game and give them a big send off. Five years of football practices and lifting weights. Five year of running conditioning drills like I talked about when I visited the field in August to check on the lighting project. Remember Courtney Robinson's interception against Montana . Remember George Byrd's blocked punt for a TD against Army. Remember when Liam Coen came in against Colgate in the fourth quarter and led an amazing comeback ? This Blog has lots of memories of the last five years. It's been a great time for UMass football and the seniors were a big part of it. Put on the thermal long johns Saturday and come to the game to watch the seniors become the winningest class ever! The Daily Collegian says UMass is playing for pride in its last game of the season. The Collegian states UMass is trying to regain focus . Marty Dobrow has an article about UMass' QB Liam Coen . The CAA expects a busy Saturday . David Coulson entitles this week's "Around FCS" column "November Nailbiters"
Up in Canada, Keron Williams was named to the All-Canadian Football League team . His UMass bio here . Meanwhile, Shannon James is going to the Gray Cup. The UMass Daily Collegian has an article on the defense's troubles . College Sporti ng News has an article about this year's National Championship and a printable playoff bracket here . Continuing a CSN morning, the latest Gridiron Power Index is here (UMass is #19). The Sports Network defogs the playoff picture . In a sad note, Bob McGovern has stopped publishing Between Mullins and McGuirk . He did a great job during the blog's run. Let's hope some other UMass fan picks up his mantle and starts a UMass basketball or hockey blog (or both!). In a related note, this is the UMass Football Blog's 2,258th post. I'm still having fun with the blog and I intend to keep it going.